The pioneer of organised retail is counting on “conscious consumption”—rather than “conspicuous consumption”—to see his group through the slowdown. Try this quick quiz: Which is the only stock amongst the 30 that makes up the Dow Jones Industrial Average that’s actually gained in the current year, even as the index slipped by 36.5 per cent, till mid-November? Answer: Wal-Mart. Buoyed by third-quarter profits that beat analysts’ expectations, and that are higher than those of a year ago, the world’s largest retailer has bucked the declining trend in US consumer spending in style. It’s been able to woo customers from other retailing formats like Target and Macy’s, who are trading down in their everyday purchases; Wal-Mart is now gearing for the holiday shopping season with aggressive schemes. 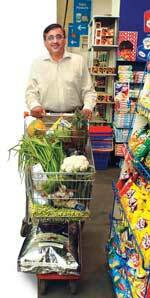 Back home, the pioneer of organised retail is hoping for a similar pattern of spending amongst budget-conscious consumers to buck the slowdown that has caught up with the Indian economy. Kishore Biyani, Founder & CEO of the Future Group, points to the 78 per cent growth in the month of October (during the Diwali season) over the previous corresponding period as a sign that consumer spending in his chains of hypermarkets and supermarkets isn’t flagging. “My consumers, who form the top 20 per cent of the Indian population, have shifted from conspicuous to conscious consumption. Until customers tell us to do so, we will not change our strategy for growth. This is an opportunity in a lifetime for us,” insists Biyani. Growth for Biyani is multipronged. For starters, he has no plans to let-up on adding retail space—he plans to add 4 million square feet in the current financial year (which will end in June 2009), and hopes to reach 24 million square feet by 2011, up from 8.6 million square feet today. Last fortnight, Biyani unleashed his game plan in fast-moving consumer goods, which range from soaps to butter to electronics to apparels under the umbrella of group company Future Brands. He has also taken the plunge into new areas of retail like rural and telecom products distribution. Alongside, the Future Group chief also has his hands full growing the consumer finance business— the second leg of his vision to tap consumption—through listed subsidiary Future Capital Holdings,even as he seeks to grow the life and general insurance portfolio in a joint venture with Generali of Italy. Such aggression is typical of Biyani who has, over the past 11 years, built a retail empire that claims to touch the life of 200 million Indians, and that covers 61 cities and 65 rural locations. He’s got some 1,000 stores up and running, across a variety of formats; these include the Pantaloons chain of fashion outlets, the hypermarkets branded Big Bazaar, supermarkets called Food Bazaar, and malls called Central. Along the way, Biyani also spread his wings by forming the Future Group, which is today present in—besides retail—consumer finance, brands, venture capital and logistics. They’re all different pieces of Biyani’s grand game plan of straddling the entire consumption space. Till a few months ago—before the economy slowed down and cash became scarce—such a dream would be labelled visionary and grand. Today, it might just seem grandiose, and even foolhardy, against a backdrop of high interest rates, a clutch of loss-making businesses and a not unrealistic prospect of consumer spending slowing down. Wal-Mart may be thriving, but surely it doesn’t have to worry about scaling up new projects, being weighed down by debt, and being in the red. Pantaloon Retail on a consolidated basis (including its home solutions and financial services subsidiaries) showed a loss of Rs 62.6 crore in 2007-08 as per data on the Bombay Stock Exchange website. Fledgling subsidiaries like Home Solutions Retail and Future Capital Holdings (consolidated) are also in the red (see Signs of Stress). On a consolidated basis, Pantaloon Retail had debt of Rs 2,750 crore on its books, and interest costs had swelled to Rs 223.6 crore for the year ended June 2008, up from Rs 100 crore a year ago. “With capital getting scarce in the current environment, Pantaloon has to seriously revisit its expansion plans,” says Sanjeev Patkar, Director (Research), Dolat Capital Market. Several broking firms have downgraded the earnings estimates for Pantaloon Retail for the current financial year. “A slowdown in the consumption cycle and high interest costs will lower the profitability for the company,” adds Abhijeet Kundu, Vice President (Research) with Antique Stock Broking. Kundu has lowered net profit estimates by 18 per cent to Rs 171.9 crore and revenues by 7 per cent to Rs 7,812 crore for the current financial year. However, he does add that Pantaloon will do better than most retailers as it has the maximum penetration. Rs 60.5 crore and Future Capital Holdings Rs 28.2 crore in 2007-08. Insurance is a long-gestation period business. With the entire industry coming under close scrutiny, Biyani has shelved plans to launch personal loans and is going slow on consumer loans. If that happens, the Rs 25-30 crore Biyani generates daily through his various retail formats will shrink. This enables Biyani to expand by virtually dictating terms to developers. For instance, he’s now entering into revenue-sharing agreements. For instance, Biyani will save some Rs 13 crore annually just on plastic bags. Biyani, for his part, expects the intensity of his competitors to reduce in such tough times, and points to that as just one of the many things going for him. The slowdown holds other advantages for the Future Group, too, he claims. One, falling real estate prices allow him to dictate terms to developers. For instance, he’s now entering into revenue-sharing agreements with mall developers; he is willing to offer 4-5 per cent of revenues, which clearly is less risky than entering into fixed rental charges. What’s more, “there has been a reduction in rentals of 10-15 per cent in the last three months,” says Shubhranshu Pani, Managing Director (Retail), Jones Lang LaSalle Meghraj. Biyani also points out that he had not signed any new properties in the past 18 months, a period during which real estate prices had shot through the roof. Stability in manpower costs also augurs well for the Future Group; the wage bill is, after all, the secondlargest cost component. Biyani also expects to expand margins as input costs of various items will reduce— utensils for one—courtesy of lower commodities prices. He also gives the example of a saving of Rs 13 crore he expects just from the plastic bags that are used in his stores as a result of lower crude oil prices; last year this cost was Rs 65 crore. Cost savings are great, but a worry for Biyani would be debt he is saddled with, and the higher cost of it going forward. The debtequity ratio of Pantaloon is already more than one, making further leverage unlikely. “Money is available but it is expensive,” agrees Biyani. “The value of money has changed.” Analysts tracking the company expect Pantaloon Retail’s interest cost to be around Rs 300 crore in the current financial year. There are also 1.26 warrants at Rs 500 per share that come up for conversion in March 2009 while the stock price is at Rs 206 (Nov. 21). “The promoters have shown commitment to the business in the past and will continue to do so,” says Biyani. Clearly, one way of easing the financial stress is to aim for quick turnarounds of the losing businesses. And that’s exactly what Biyani has in mind. Take, for instance, Home Solutions Retail, which has a net loss of Rs 60 crore on revenues of Rs 891 crore; then there’s Future e-Commerce, which is in the red to the tune of Rs 9.5 crore. Biyani says these businesses will turnaround in the current financial year. If such reversals in fortunes don’t happen soon, the Future Group may need to look at selling stakes in businesses to raise funds. Biyani has plenty to choose from. Recently, for instance, the group exited a joint venture for airport retail with Alpha Airport Group of the UK. “We can dilute, hive-off or sell businesses. I have no emotion attached to anything.” Are the investment bankers listening? • Adding retail space at a faster pace. By June 2011, he plans to reach 24 million sq. feet of retail space, up from 8.6 million sq. feet today. • Launching high profit margin own brands: These brands will be in segments ranging from toothpaste to shampoo to butter. • Entering into new segments like rural retail and telecom products distribution: “Through Aadhar we can ramp up rural retail, which is outside the 20 per cent of the population we have been targeting so far,” says Biyani. • Has scaled down the financial services prong of his consumption strategy, specifically personal and consumer loans. • Pantaloon Retail has divested its stake in a JV for airport retail. • “We can dilute, hive-off or sell businesses. I have no emotion attached to anything,” says Biyani.